Replacement is to start on April 15 at North Oconee High School and then move to Oconee County High School on May 15. Work is scheduled to be be completed by July 31, and no disruption of sports schedules is anticipated. School administrators will be asking the Board to accept a low bid of $2,214,850 from Sports Turf Company of Whitesburg, in Carroll County, west of Atlanta. In introducing the sports field project with the Board of Education at its meeting on Dec. 4 of last year, Jake Grant, chief operating officer for the county, noted that it reflected the “extracurricular needs” of the schools. The Board of Education, at its meeting on Dec. 11, voted to approve a contract for $8,574,000 with Kevin Price Construction, 2500 Daniells Bridge Road, for eight classrooms and an upgrade of the heating, ventilation, and air conditioning system at Oconee County High School. Construction is to start immediately, and the classrooms will be open for the coming school year. School Superintendent Jason Branch told the Board at that meeting that total project cost for the work, including carpeting, architectural fees, and other services will be $9,359,700. Funding will come from Education Local Option Sales Tax revenue. The construction will bring the capacity of Oconee County High School to 1,500, Operating Officer Grant told the Board. Funding for the sports fields upgrades also will come from ELOST and from general funds, according to Anisa Sullivan Jimenez, director of communications for Oconee County Schools. Branch reported that the decision to make the change had come after conversations with Dallas LeDuff, director of student services, and the coaching staff. At the Board meeting last Monday, Grant said that he, LeDuff, and the athletic directors from the two high schools had traveled more than 800 miles around the state to different sites to determine the best quality product for the fields. Director of Communications Jimenez said the North Oconee High School tract was installed during the 2006-2007 school year and the Oconee County High School track was last renovated during the 2009-2010 school year. The district had planned to resurface tracks this summer and “doing the track and turf projects at the same time is a cost-savings versus doing them at different times,” she said. The fields at present are Bermuda grass. The tracks are a latex surface over asphalt, according to Jimenez. The natural grass will be replaced with a poured rubber that is around 10 millimeters thick, Jimenez said. The synthetic turf is approximately 2-inch blades of grass with the bottom half-inch being a woven material to minimize fly-out of rubber, Jimenez explained in a series of email messages to me this week. A “root zone” holds the rubber in place, she said. The track and field will last at least 10 years, Chief Operating Officer Grant told the Board at the Monday meeting. Board members focused mostly on aesthetics in their questions of Grant on Monday. Chief Operating Officer Grant said that the contract included multi-colored permanent lines for soccer and football and tick marks for lacrosse. The fields will then be painted as needed for lacrosse. The contract also includes painting of end zones and the color logo in the middle of each of the fields. In response to a question from Board Chairman Tom Odom, Grant said that, after 10 years, the fabric would need to be replaced, but at a lower cost than the initial installation. Superintendent Branch is expected to recommend that the Board of Education approve Sports Turf Company contract at the Feb. 5, 2018 Board meeting. 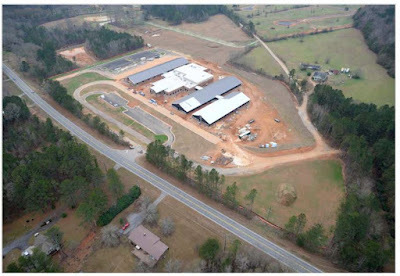 Chief Operating Officer Grant said on Monday that “We’re where we should be” with construction of Dove Creek Elementary School on Hog Mountain Road between Osborne Road and Dewey Road near the Barrow County line. Amacher Bros. Construction Company of Atlanta has the $13.2 million construction contract for the school, which is to open for the next academic year. “Its on schedule, and we’re pleased with the contractor’s progress,” Grant said in response to a question from Board member Wayne Bagley. Grant did say there has been a delay in road work for the project. He said it had been “his understanding” that the county would submit plans to the Georgia Department of Transportation within first 10 days of January and that has not taken place. Hog Mountain Road is a state route. Grant said he has been told by Abe Abouhamdan, who is serving as Oconee County project engineer for the work, that Abouhamdan plans to submit the plans to the Georgia DOT at the beginning of February. The Board of Education and the Oconee County Board of Commissioners signed an intergovernmental agreement late last year in which the county agreed to obtain GDOT permits and design approval for acceleration and deceleration lanes coordinated with three entrances to the school along Hog Mountain Road. In his report on Monday, Superintendent Branch said that the school system will not have to make up any of the time cancelled because of weather because of excess instructional time in the schedule. Saranna Charping, chief financial officer, released data that showed that ELOST revenues for the last 14 months were $8,017,080.65, up only 1.16 percent from the same 14 months prior, when $7,924,848 was collected. Over the last 12 months, ending in December of 2017, the U.S. Bureau of Labor Statistic’s Consumer Price Index for Urban areas, the most common index of inflation, was running at 2.1 percent, meaning that sales tax revenue in the county are not keeping up with inflation. The county actually showed revenue declines in four of those 14 months, including a whopping 21.4 percent decline from March of 2016 to March of 2017. The school system has collected $31,589,984 from ELOST IV, approved by referendum of county voters in 2012, according to Charping’s report. According to the legally required ELOST report, published in the county’s legal organ, The Oconee Enterprise, and released by Charping to the Board, the system had spent $29,841,214 from ELOST IV as of June 30, 2017. Charping said she will have one more month of revenue for ELOST IV before ELOST V, approved last year, goes into effect. The full video of the meeting of Jan. 22, 2018, is below. Grant made is comments starting at 27:00 in the video. Board member Bagley asked about the status of Dove Creek at 43:44. The superintendent report is at 46:34. The video begins with recognitions of accomplishments of the school system. OCO: BOE 1 22 18 from Lee Becker on Vimeo. The video of the Dec. 4, 2017, Board of Education meeting is here. The discussion of turf and track replacement is at 20:48 in that video. The video of the Dec. 11, 2017. Meeting is here. 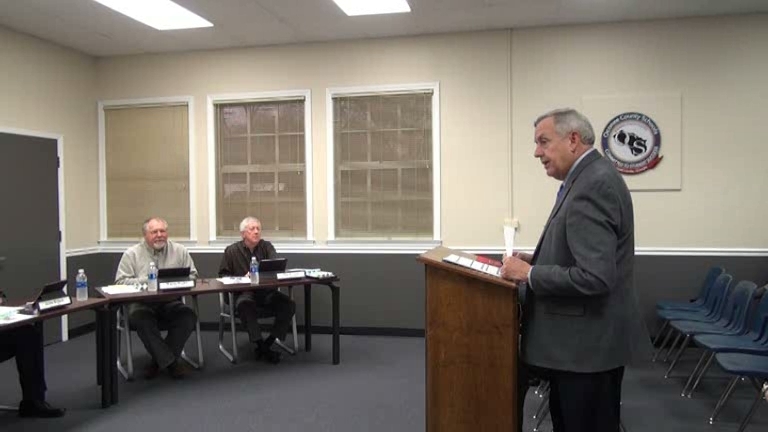 Discussion of the Oconee County Highschool classroom additions and HVAC replacement is at 26: 45 in that video. As a concerned parent of a high school athlete, is anyone else alarmed to hear about the switch to artificial turf at our high schools ? While not conclusive, some studies suggest a cancer link in kids that play on turf fields with rubber. To be fair other studies suggest it is safe. Have our educators had any discussions with parents about players safety considerations before the decision was made ? Meanwhile, teachers work longer hours, with less Administration support, with inadequate supplies, and crumbling infrastructure.